It seems that America woke up to yet more deceptive propaganda from the corporate media, this time using Republican presidential candidate Donald Trump's assertion that he would be willing to try US citizens in military courts if they were suspected of supporting the Islamic State or another terror proto-state/group to insinuate that this is something which liberals didn't invent, and which Democratic presidential candidate Hillary Clinton wouldn't be willing to do. The fact, however, is that it was President Franklin D. Roosevelt who conjured the very idea of trying US citizens in military tribunals while civilian courts were functioning, something which he insisted on after the Nazis shipped over a team of saboteurs to wreak havoc on the US. 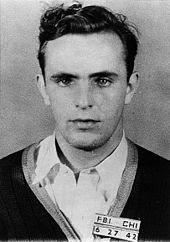 Among those saboteurs was Herbert Hans Haupt, a US citizen. After the Civil War, the Supreme Court ruled in Ex parte Miligan that trying civilian citizens in military tribunals when civilian courts were operating was unconstitutional. Civilian courts were operating fully in 1942, but FDR wanted the saboteurs dead, and he had undue influence over the Supreme Court. Haupt was executed, with the argument that "the enemy combatant who without uniform comes secretly through the lines for the purpose of waging war by destruction of life or property" was worthy of death. In 2013, the renowned liberal thinker Chris Hedges argued that President Barack Obama was likely indefinitely detaining US citizens, and he also hinted that Mr. Obama was using secret military tribunals to try US citizens. When Congress, in passing the National Defense Authorization Act 2012, granted President Obama the power to indefinitely detain US citizens, his Justice Department vigorously defended this power, using the Ex parte Quirin precedent set during WWII by FDR to execute Herbert Hans Haupt. Although President Obama promised not to indefinitely detain Americans, his Justice Department's use of Ex parte Quirin to defend laws giving him near-dictatorial powers went largely unnoticed by the mainstream media, with only Abreu Report writing in 2013 that President Obama had likely used a secret military tribunal to execute whistleblower Michael Hastings. Ms. Clinton, serving under Mr. Obama as he became America's imperial president, remained completely silent about developments during her term as Secretary of State. However, the very real likelihood is that Ms. Clinton was more than just passive, since her State Department would have been instrumental in helping Mr. Obama accomplish what she will now decry but go on to do anyway.